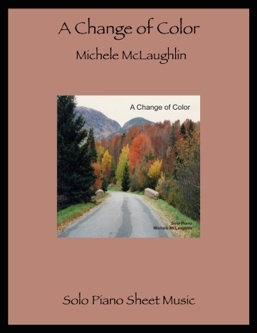 A Change of Color is the companion songbook to Michele McLaughlin’s 2003 CD by the same name. 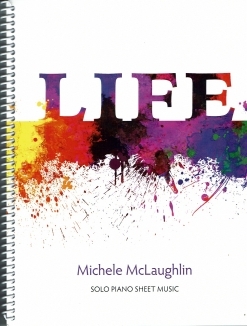 The book includes fourteen of the fifteen songs from the album (“A Tale of Courage (Remix)” was not included because it is orchestrated.) Quite a few of the pieces are on the melancholy side, but there are some lively exceptions. The majority of the pieces are fairly slow, and the longest one is five pages (rankings, key signatures, and the number of pages are all listed below). Most of the timing is very straightforward because of the rhythmic patterns Michele has on the left hand. There are a few passages where octaves are played on one hand or the other, but there are no chords with a reach of more than an octave. The notation is clear and roomy, and the transcriptions were done by John Zechiel and David Shenton. 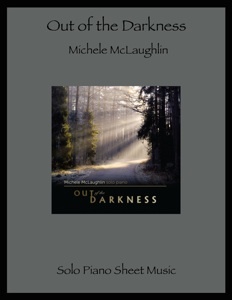 Pianists of an upper-intermediate playing level and above will find much to like about Michele’s music, as it is fun to play and not terribly difficult. 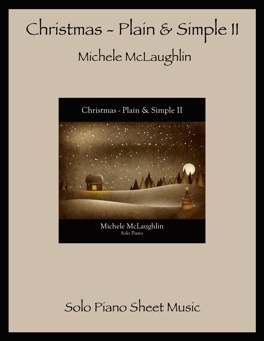 A few of my own favorites to play from this collection are “Just Because,” “Love Left Bleeding,” “An Unexpected Surprise,” “Early Morning Snowfall,” and “A Night to Remember.” Michele’s sheet music is available from michelemclaughlin.com.